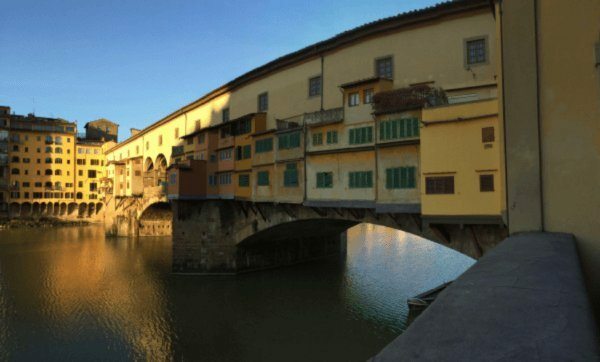 We arrived in Florence tired but truly excited and trundled through the streets to our hotel. When we got to the square it was in it took a while to locate it as many hotels don’t have big signs. I could almost taste the gin and tonic as we walked in and we were both thoroughly impressed by the hotel. Sadly they then told us there had been some mistake and we were booked in a different hotel nearby – not what we’d been hoping for given the travelling. In short, we were grumpy. But, in reality, we could do nothing and it turned out to be what was probably a better hotel called Grand Hotel Baglioni where we stayed. The owner of the first hotel assured us the Baglioni had a roof terrace so after unpacking we headed straight there. And, oh wow! Nothing could have prepared us for the view that awaited us. It was early sunset and the sky was turning smokey pink over the Tuscan hills. 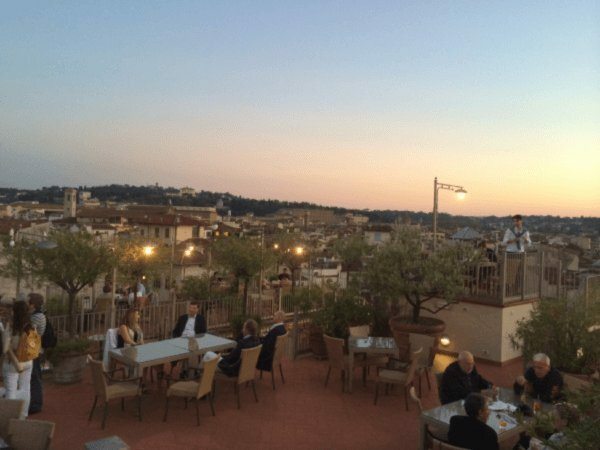 We had a 360 degree view over the rooftops of Florence (a sight not to be underestimated – a sea terra-cotta tiles and parapets). It was one of the most memorable sights I have seen. The bar has lots of little elevated terraces on several different levels. It didn’t matter that the service was rubbish and Mel ended up going down to the bar himself. It was still absolutely magical. 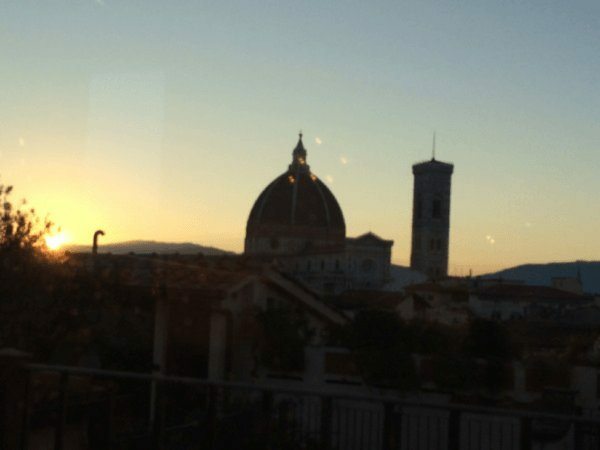 We ate in the Piazza Santa Maria Novella which was good – but expensive. 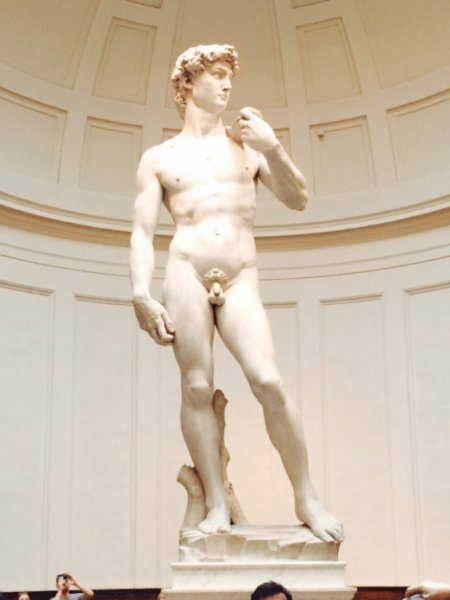 During our first full day in Florence, we had bought tickets online to see David but we could have saved the bother as when we arrived at 9.30 the queue for reserved tickets was longer than the non-reserved one. Anyway, it was well worth standing for half an hour as David did not disappoint. We wandered the bustling streets which were extremely busy and it was pretty hot today, especially for late September. We bought sandwiches and went to the Boboli gardens only to find they were closed following the hail storm last week! Apparently 1.5 million euros of damage was done to the city’s gardens and museums. So we substituted it with an ice cream to dribble down our fronts and a walk round the Duomo and now back on the idyllic roof terrace. 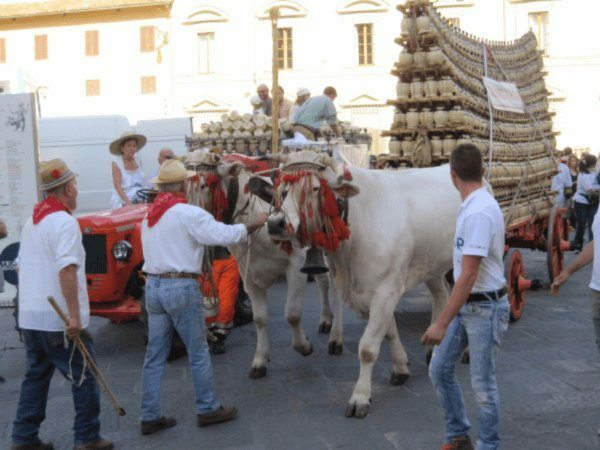 As we wandered the streets today we came across two bulls pulling a cart full of chianti bottles. It was followed by various people in costume and we assumed it was the start of the new season – but Mel went to buy a bottle and it was a 2012. Very cheap at 6 euros. Tomorrow is Sunday so it must be Sorrento! 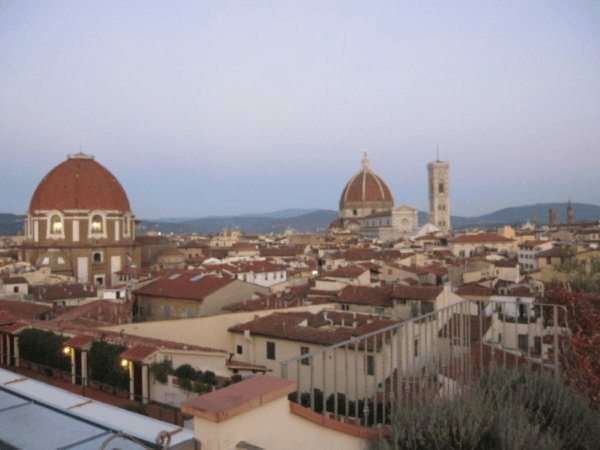 On Sunday watched the sunrise over the rooftops of Florence whilst eating breakfast – what a sight! Then walked to the Ponti Vecchi in quiet Sunday streets. It was great to see it after the hoardes had left and for a while we had the place almost to ourselves. Until suddenly hundreds of people came from nowhere and we suddenly realised we were in the middle of a huge marathon/ fun run. In truth, this made lugging our cases to the station a bit more difficult against the crowd but it was a short trip and we made it in the end. The train trip to Naples was incredibly busy and we were lucky to have four seats to ourselves until we arrived at Rome, when we were joined by two very pleasant Americans. The rest of the train journey was spent comparing rail journeys and in the case of the woman and I comparing who was more excited about arriving at Sorrento! I think it was me as I felt like a child at Christmas. We had read a large number of stories on the internet regarding pickpockets at Naples station so we were very pleased to see our driver with his sign for us at the end of the platform. He was a pleasant individual and a good driver and I only had a few major panics on the one hour transfer to Sorrento (which is very god for Italian driving!). 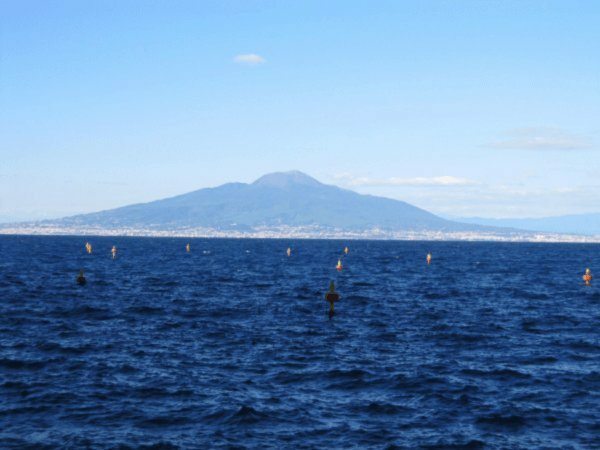 As we got nearer the excitement mounted when we could see the town in the distance and seeing Mount Vesuvious for the first time was very special. We drove through streets that were busier than we had expected until the road seemed to simply run out. The driver stopped and said we would have to walk from there and so we trundled over ancient cobbles to the Hotel Regina. Inside we had a fantastic reception and the receptionist sat us down and told us all about the hotel and the town – a really interesting insight! What a difference from the hotel in Florence who did not even provide a hotel guide in the room. Outside I could make out growing orange and lemon trees and the hint of a pool just waiting for us. And that is the first thing we did – unpack, eat, swim, sunbathe – bliss! Our room is on a corner with not one but two balconies (imagine my excitement when I saw that) and the most fabulous views over the water. As I write this now it is early next morning and i have been out on the balcony doing yoga… We are just now waiting to see the sun come up. I have even taken the liberty of ordering breakfast in our room as a treat. 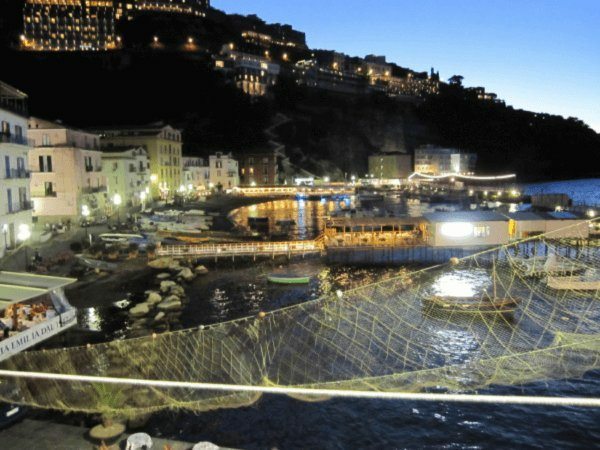 Last night we wandered down to the beach area where all the little fishing boats are and the sight of it through the arch as we walked down is another lasting memory – this trip has given us so many! We returned a couple of hours later to sit at a table next to the beach to eat pasta and fresh fish in perfect peace and tranquility. We thought it a good idea to walk in to the town proper for a coffee after dinner but that proved a big mistake. Sorrento was busting at the seams and it went a little way to putting me off the place. So many cafes and restaurants and shops- I had not been expecting that. Every cafe was crammed, there were screaming, bored children everywhere and we even saw the dreaded English pub with full breakfast. Thank goodness we had eaten early and virtually alone by the sea. So we returned to the hotel and its rooftop bar where we only had four other guest to share it with and the music was ambient. The stars were out, the drinks were poured , we had the view of the Bay of Naples so what else could we want or expect? 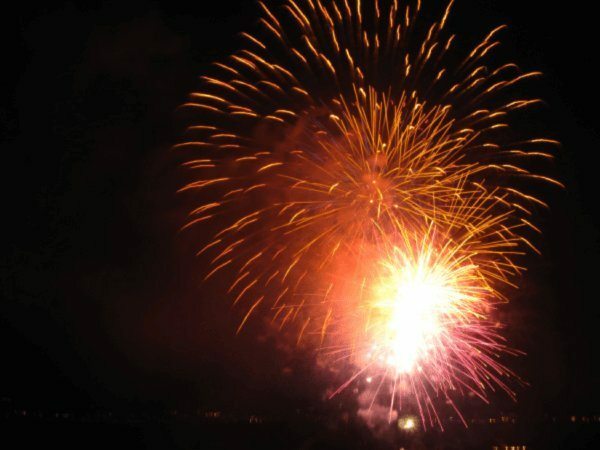 Well out of nowhere a huge firework display started and lasted a good quarter of an hour. There were hearts in it and I secretly thought it might be for George Clooney and wife. On our walk home there had been much fuss at a nearby posh hotel with a big police and diplomatic protection presence. Could he be round the corner I wonder?